As I write this, Declan is coming up on four and a half and Silas is fast approaching two and a half years old. It’s not so much the actual numbers of their ages that are important but more so the development they each have achieved along the way. 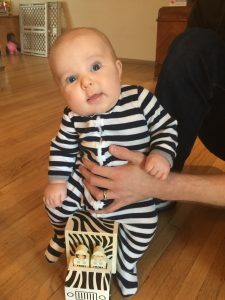 We have known since Silas was born that at some point it would be very likely that certain aspects of the boys’ development would be at a parity. It seems as though recently we’d just begun to notice that and in the same breath Silas started eclipsing his older brother in many areas. I’ve always said, and still maintain that I love moments in life that can give me perspective and lend value to the moment. You want some perspective? Well, let me give to you autism. Declan, being our first born child, was our normal, baseline experience for everything parenting-related. Sure, we knew that not everything he did or everything we have gone through was “normal” but it very quickly became our normal. We had never raised a child before and so had nothing to make a comparison against. We adapted to no more than two hours of sleep at a time for the first year and a half Declan was alive. We got used to dietary sensitivities and stomach issues. We adjusted our schedules and lifestyles to work with and around autism. Therapies, paperwork, lengthy, frustrating phone battles with insurance, late nights and early mornings all became our norm. At this point, we were all pretty much fully in to the swing of things with Declan’s therapy schedule. We knew he was autistic though he didn’t yet carry the official diagnosis. Our everyday schedule revolved around everything autism-related. When Silas came in to the picture we quickly realized that he was very different from Declan. There were certainly similarities like Silas being a large baby (though not as large as Dec) and being a terrible sleeper, but it was really the differences that stuck out. From very early on we noticed more interaction from Silas. More eye contact, more reciprocation, more of a presence. Silas was, and definitely is today, the biggest personality in our family. As development progressed, the differences became more apparent. Silas played with toys. He shared things with us. He could cope with things. Declan had never done any of those. Experiencing these for the first time is undoubtedly amazing for any parent. Experiencing them for the first time after mourning the absence of them… that is a dose of perspective that I was not ready to digest. I have had many such instances and feelings since then. They’ve come about at various times in different arenas of development. 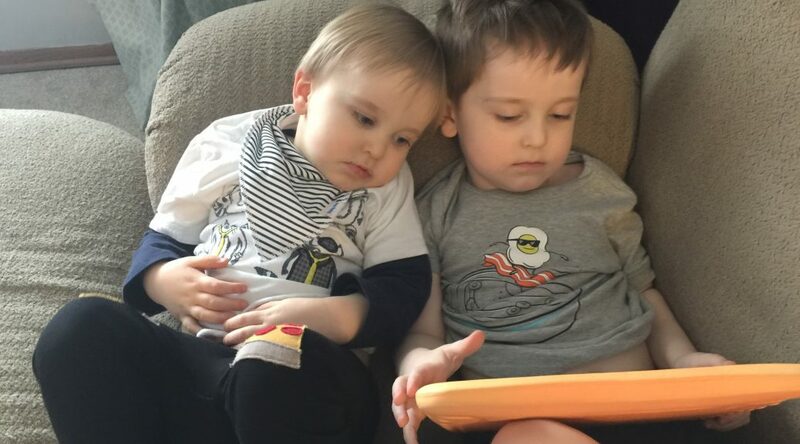 Taking an iPad or other toy away from Silas may lead to a small fit of upsetness, but it doesn’t result in a meltdown that carries the potential for hours of disregulation to follow. Silas can wear any shoes. Seriously, this was amazing to me! Declan is VERY specific about his footwear! We can just drop Silas off at the daycare at the gym for an hour and he’ll play, just like the rest of the kids. It’s. So. Easy. This has never been in the cards with Declan. Silas can be around larger gatherings of people and can deal with it just fine. We tend to skip most events if this nature with Declan. This is a challenge for a little ways down the road. And the list goes on, of course. I don’t want any of this to sound like a better and worse comparison situation. It’s not. The differences in our boys really stick out in my head sometimes. It’s the differences in them that garner the perspective I gain. Without experiencing the differences in both boys, I certainly wouldn’t have the perspective I do. I think that perspective adds so much beauty, so much value and so much vibrancy to our lives. Those things are very dear to me. So what brings this all to my mind currently? Well, while I don’t know if I’d call Silas “normal”, I do know that he is neurotypical. I don’t know what the hell normal is, to be honest… Silas isn’t quite two and a half and he’s sounding out and reading words, spelling, counting, shapes and colors are on point, so yeah, normal? Probably not. Declan’s handy work, spelling “proud”. Declan, at four and a half, has all those things nailed down as well. He has the ability to see or hear something one time and commit it, virtually flawlessly, to memory. He can spell 80-100 words, is beginning to use multi word combinations and is really figuring out how to express his needs. Dec can count to the seventies, count by twos and threes, count backwards and meaninfully combine letters, words and numbers to form what he wishes to express. It’s amazing to watch and experience. He’s put in an amazing amount of hard work to get to this point. We think a lot of what Declan does is the result of memorization. Some new, different manipulations of words and communication have been popping out lately, such as his multi word combinations, that we think are bridges being built and gaps being spanned. Declan has new things click in place virtually every day and it makes him so proud. He beams. And so do we. So, all of these things that our boys are doing. All the similarities, their shared passion for letters, numbers, colors and shapes. And the differences that bring this all to light in my head right now? Many of Declan’s skills are based on memorization and scripting. Silas, on the other hand intuits much of what he does. 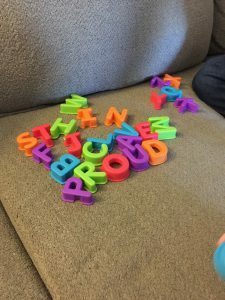 Silas will see Declan spelling a word and then spell it himself and experiment with manipulating the letters differently. He figures things out and builds upon what he’s learned. Declan is usually content to spell and count all on his own for quite some time. Silas loves and needs to share these things with us. He’ll spell “E-L-M-O” and run up to us to tell us “Elmo” and maybe show us a picture or an Elmo doll. Silas is always in our faces telling us his colors or shapes, counting or spelling…something. It’s awesome. And while Declan loves doing the same things, he typically prefers to go at it alone. Silas is a wonderful little reminder of the opposite end of the spectrum, and when appropriate, a reminder to get up in Declan’s face and share moments with him. We’re not around other little kids very much at all so we don’t have much basis for comparison as to how other kids act. For that reason, I am thankful that our boys are so similar in some was and so wonderfully different in others. If it weren’t for Declan, I don’t think we’d fully appreciate the amazing nature of the wild, rambunctious, assertive little boy that is Silas. And without Silas, I know that Declan wouldn’t have been pushed as much as he has been. I think we may have had a tendency to just go with the ease of letting Declan just do his own thing. We still do do that a good portion of the time, but we definitely challenge him as well. Silas’s presence really helps with that. Two little boys who share the same gene pool and who are undoubtedly brothers. Two sides of the same coin. They have each changed our lives in more ways than I can think of and impacted us so incredibly deeply. The perspective I’ve gained from being the dad of both of them is second to none.